There’s been plenty of speculation over Australia Post’s future in the face of digital disruption. The decline of the traditional post business, rise of omni-channel customer interactions, increased digitisation of services and support, as well as an overarching need for rapid innovation, have put all aspects of the business under the microscope. 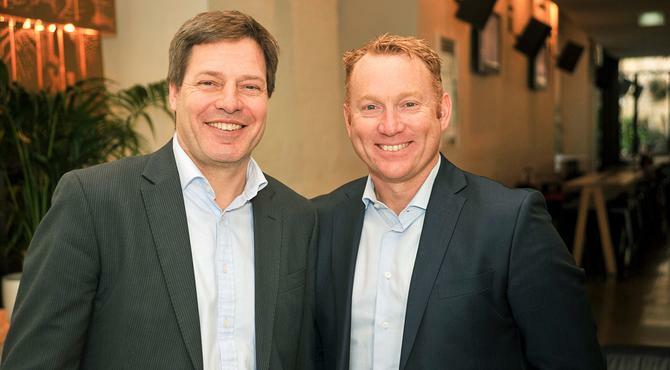 Two senior executives tasked with leading Australia Post into the new age are one-time CIO and now executive GM of trusted services, Andrew Walduck, and CMO and now executive GM of consumer and SMB products, Greg Sutherland. Both are positioning digital transformation as an opportunity for customer-led innovation and sustainable change. Both also agree their efforts are transforming the very nature of what it means to be a marketer, and a technologist. Walduck and Sutherland’s roles have changed over the past month to reflect their cross-functional leadership and closer ties to innovation. Walduck, who spent the last three-and-a-half years as CIO overseeing technology and digital properties, now oversees a portfolio which he says will form the basis of Australia Post’s future. Within this, he’s responsible for driving the product innovation agenda and working with customers around how to create the products and services that will sustain the group’s future. Sutherland, meanwhile, retains his CMO responsibilities while overseeing consumer and SMB, a role that gives him further scope on product and services innovation and digitisation. The two positions are part of a six-strong executive management team at Australia Post. The pair are quick to point out, however, that they’re not doing digital alone. Across the entire business, Australia Post is embracing digital disruption as the impetus for adopting new ways of working that put the customer firmly at the centre of business decision making and product and services innovation. CMO caught up with both Walduck and Sutherland to discuss how digital is changing the roles of CIO and CMO, and what they’re doing to embed new ways of working into their culture. How does Australia Post view digital as a business? Andrew Walduck: The focus needs to be where our customers have made decisions on how to interact with us. This could be starting on the Web, or in some cases start on a third-party website, where our API or organisation’s capabilities are enabled inside another organisation’s experiences. Our focus is on enabling that service to be a frictionless and beautiful experience our customers will advocate. The thing that is incredibly important to Australia Post is that we balance that with enabling great physical experiences that are consistent, and that occur at the times most appropriate for our customers. Ultimately, we are shifting from being a network-centric business that got excited by trucks and motorbikes, and which delivered to addresses, to a customer-centric business, where we deliver to a person. It’s the experience a customer has inside of that process that makes the difference. And we need to get that right every time to those 11 million homes we deliver to everyday, and to the million people that come into a post office on our busiest day, plus the hundreds of millions of interactions online. There are lots of opportunities to get it right, as well as not. Greg Sutherland: Customers are empowered, they’re equipped with a lot of information and value service, and they can appear in any of your channels. The challenges companies are having with that opportunity is to create great customer services. Whether it’s online shopping, opening a bank account, or getting a driver’s licence, we realise at Australia Post that we’re part of a system with those businesses that together, creates a great customer experience. We have to be good listeners every day, and we’ve got to drive improvements every day, but we’ve also got to look at systemic issues to drive innovation and opportunity. Traditionally, we might have built a product and then someone would buy it; now it’s about how we co-create with our customers and do things together. We are evolving to create a product, service and experience fundamentally better to what we would have offered in the past. Andrew, what are some of the steps you’ve taken to date as CIO to help position Australia Post for a digital-first future? Andrew: The work I’ve done to date is around fundamentally changing how our technology enables us to create products and go to market faster. I’ve also created a method of building products and services that embraces innovation, ideation, as well as how we use those concepts to disrupt ourselves and create a future that might not otherwise have been possible. For future leaders who understand technology, it’s all about how you can embrace technology to do fabulous things. Why was it necessary to change the operational structure? Andrew: Greg and I have joined one part of the organisation as a demonstration of the fact that hierarchy doesn’t matter in the new world. What we need to push is a deliberate, ongoing cultural change. It doesn’t matter if you’re in one part of the organisation, you can still enable the entire enterprise. This is part of us deliberately disrupting ourselves to challenge organisational thinking and create the future. How have you seen marketing and IT change in light of this new paradigm? Greg: There are two things that are important here. The first is that there really aren’t two sides to this anymore, or two angles to this story. There’s only one idea about what the customer wants. Technology is interwoven into their lives and whether you’re marketing or technology, you’re being driven by that. As a marketing function, the role adjustment I’m implementing is being driven by what marketing is now. It’s no longer what you say, it’s what customers say that counts. One simple definition of a brand I really like is that a brand is a promise, followed by an experience that creates a memory. It’s now all about what happens in that experience. Marketing and customer service resources are being integrated, and the actual teams and functions creating and delivering the experiences, such as the contact centre, Web and digital teams, social teams and post office development team, are being integrated into one new unit. Because our customer base is both consumer and businesses, I have a title that reflects that, but it also reflects what contemporary marketing is now, which is listening to and orchestrating the experience in each moment. If there is a core marketing role, it’s curating the story of that experience for customers to tell. It’s what they say that’s going to matter. We’ve also got to create a platform to curate their story to be heard by others. If you don’t do that, it tends to be only the bad experiences that are curated or get told. The first role of marketing is in our channels, the second is social reference, then the third and final role is paid media. And there has to be a context for paid, rather than it being the primary driver of marketing. This is what contemporary marketing is all about. How specifically is digital changing product development and customer engagement at Australia Post? Greg: What digital has done is thrown open what product innovation is. In my mind, there’s no such thing anymore between a product and a service thanks to digital, it’s all an experience that creates value for me in my life. Whether that’s making my life easier, more fulfilling, or enabling me in some way, the very nature of my consumption is an integrated experience. The major investment we’ve undertaken in the last 12 months is to double and triple down on our listening capabilities with customers. We’ve moved from pulsing feedback from customers to doing this all the time. It’s also about making the idea of giving feedback a frictionless experience as well. The second thing we’ve had to do is work with HR on culture to make everyday improvements with the customer’s voice as our guide. In the past, we’ve had quality improvement programs and daily operation huddles – for example, in our distribution centres, we would look at their service delivery on a chart and it’d be an internal measure of delivering on time. What we’ve now done is introduce what the customers say about those services too. It’s the story of the customer that changes the culture, not the measure itself. When we show that to the delivery team, it changes everything. The current focus is building the systems with technology to make it a scalable event. Andrew: Through our business investment program, we’re investing in ways we do that too. When we introduced parcel locker, for instance, we also changed the experience you have in the post office. When we built out a number of our new parcel delivery networks, all of that was done by pulling together a sense of not only where we want our business to go in terms of strategy, but also the business and IT architecture underpinning that. We have progressively looked to consolidate to a single customer record, so we have an ability to know who a customer is when they call our contact centre, when they interact with us online, when they come into a post office, and when they interact through all the channels and means available to them. We have built that foundation, which is critical. It also helps us to better know who our customers are so we can better personalise the service they then have. MyPost [app and vendor machines for tracking post] is an example of where we’re embracing this whole notion of personalised experience that a consumer or business can have when they interact with us. What learnings have you taken away from each other’s IT and marketing backgrounds to improve the way you work? Greg: Andrew’s the most passionate CIO I’ve ever known. He’s naturally human and customer centred, and recognises technology has to be designed for human beings. Interestingly, there are similarities between marketing and IT. Within the marketing field, there is this whole idea of customer experience design, and how you ideate with divergent thinking, converging prototypes and so on. The same method has been applied to technology innovation, it’s just been under a different name - Agile, for instance. So there is a lot of capability and resource with the IT function reflected in our [marketing] function. In a software and cloud-based world, the idea of how technology is implemented and developing technology products and solutions has had to change. How marketing thinks today reflects the same ideas. In some senses, technology was further advanced in thinking in a digital space. In a service-oriented world, you have to be agile, test and learn, and so on. Being able to throw more customer information into the technology function as a new method for creation and iteration has been wonderful. It’s made things faster. What technology teams haven’t completely understood is how agile methods are more central to the operating method of a company, not just technology departments. Andrew: What I found in Greg was a kindred spirit who understood what technology could enable. We spend less time explaining it, and more time talking about what we could create with it. What we talk about is what we can do to overhaul the customer experience. Greg has a depth of knowledge around customer understanding and brand, and it’s been great being part of the work he’s done around reinvention of our brand and how that can be built around having a technology heart to it. That’s where the value can be for a future enterprise. While a lot of CMOs and CIOs now recognise the importance of collaboration, there are still often issues getting teams sitting underneath them to work successfully together. How are you addressing this? Greg: The natural structure of marketing and technology has been disrupted. The old marketing structure was nicknamed the brand police. We were sitting out there, stopping everything being done. It was the same with IT – you’d have strategic enterprise architecture and everyone would want to do something fast, but no, it had to fit into the structure and rigour of the architecture. That created problems. Striving to embed technology in the product business, which is what Andrew is doing, and embedding marketing in the channel business, which is what I’m doing, is what I believe must be done. Andrew: Part of Greg’s change is marketing capabilities go with him, but with my change, some of the technology capabilities come with me. What it provides both of us with is an ability to take all the things that are great about how we have worked to produce a new way of working internally. While strategy is critically important to an organisation’s future, what is increasingly important is how you execute, and how you create. For the people further down the organisation, there does need to be change. Some of that is changing their focus and point of alignment. We don’t hold back from any discussion about brands, marketing, technology and what’s the right product choice to make or how we should create something for the customer. No one department dominates that discussion. That challenges some traditional norms. It’s the focus on what is it our customers want that makes the difference. What Greg has done is give us the ability to bring that beautiful insight into our organisation. It’s how we connect and produce great outcomes around this which is the unifying force pulling us together. Plus we make it non-negotiable. Greg: The alternative you’re seeing is where organisations have appointed chief customer officers or digital officers separate to the CIO and CMO. Why not make the CIO vested in digital technologies around the product, and make the CMO’s first job customer experience? Andrew: What you need inside an organisation are executives who have an ability to affect fundamental change. Some companies are appointing a chief digital officer, and maybe that’s appropriate for their culture and where they’ve come from. We haven’t gone down that route at Post, and digital is arguably a mantle both Greg and I share. Our point of view is that the ultimate outcome is to get an organisation to not only disrupt itself, but take advantage of the opportunity that exists from interacting digitally with customers. More widely, how has digital disruption changed the skillsets and how you bring talent into your organisations? Greg: It’s not just the teams but also the supply base that needs to be considered. This question of how technology solution companies and marketing come together. Remuneration and all of that is changing as a result. Andrew: One thing we do know is we can’t find the exact person we want. So we’re spending more time on processes that help us build and invest in this capability. There’s no templated role out there that provides us with an individual with a whole lot of experience who’s done it before. Through our graduate programs, we invest in certain types of capability, which brings in a lot of wonderful energy, and through our external recruitment programs we also bring in people that have a fit in terms of profile, then we grow the rest.